Last night CNN en Español aired the above image, which captions at the bottom “Who Killed him?” by “accident”. 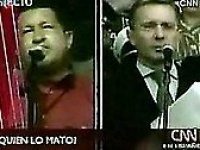 The image of President Chavez with the caption about killing him below, which some could say subliminally incites to assassination, was a “production error” mistakenly made in the CNN en Español newsroom. The news anchor had been narrating a story about the situation between Colombia and Venezuela and then switched to a story about an unsolved homicide but – oops – someone forgot to change the screen image and President Chavez was left with the killing statement below. Today they apologized and admitted it was a rather “unfortunate” and “regrettable” mistake. Yes, it was.